Eye clinic “OkoMed” - specialized eye clinic rendering medical services for diagnostics and eye treatment. Our specialists for more then 15 years are helping people to see the world in it’s brightness and colorfulness. We are using the most advanced technologies and equipment. All at Your service, all at Your disposal. We wish you good health! Moscow multidisciplinary ophthalmologic clinic «ОkoMed» has been opened in 1997. Over the past 15 years of development we have arranged two new, fine operating rooms equipped by the last word of technics. Thereby providing the excellent opportunity for performing a wide range of microsurgical operations on the eye. The Laser operating room is equipped with the excimer laser of the last generation – Allegretto Wave made in Germany designed for surgical correction of any refractive disorders – myopia (short-sightedness) of all degrees, hyperopia (far-sightedness), astigmatism, presbyopia and anisometropia. Departments of laser surgery, pediatric ophthalmology, anesthesiology and intensive therapy have been arranged. Modern computer diagnostic rooms have been opened too. The General Director of the clinic, full member of European Society of Cataract & Refractive Surgeons (ESCRS), MD Korshunova Nadezhda Konstantinovna, is the main specialist of the centre who has been the leading refractive surgeon of the clinic of the famous Soviet/Russian ophthalmologist, professor Svyatoslav Fyodorov during 30 years. Scientific supervisor and consultant of the clinic - MD, full member of European Society of Cataract & Refractive Surgeons (ESCRS), professor Ivashina Albina Ivanovna, a disciple and colleague of academician Svyatoslav Fyodorov, an active creator and successor of his scientific and clinical school. The chief doctor and the leading surgeon of the center – full member of European Society of Cataract & Refractive Surgeons (ESCRS), Dr. Gulyaev Mikhail Vasilievich, a surgeon with the experience of more than 20 thousands of eye operations in Russia and abroad. Dr. Merzlikin Mikhail Dmitrievich is a laser surgeon of the clinic, full member of European Society of Retina Specialists (EURETINA), a skilled ophthalmologist. Dr. Yugay Aleksandr Gerasimovich is a doctor of highest grade, full member of European Society of Retina Specialists (EURETINA), very experienced vitreo surgeon. He consulting and operating the most complicated cases of posterior segment of eyeball. Professor Shigina Nina Alekseevna, MD, full member of the European Society of Cataract & Refractive Surgeons (ESCRS), homotoxicologist and an expert in cell therapy with the record of service of more then 40 years and huge experience of surgery of appendages of an eyeball. Clinic is equipped with the latest generation ophthalmological, microsurgical, medical equipment and tools from the leading world manufacturers from USA, Germany, Japan and others. All consumables meet the high technological level too, modern viscoelastic for the protection of intraocular tissues, flexible, foldable, elastic intraocular lens (IOLs) give surgeons an opportunity to perform all operations on the outpatient basis, painless, through micro incision and let patient go home on the same day. At present time in our clinic you can get medical services, starting with selection of glasses or contact correction and finishing with the most complicated surgical and laser eye operations on an outpatient basis. We are using the modest high level technologies to treat the following eye disorders: cataract, glaucoma, myopia (short-sightedness) of all degrees, progressing myopia, hyperopia (far-sightedness), astigmatism, presbyopia and anisometropia, keratoconus, inflammatory diseases of eyes, eye diseases of posterior segment of eyeball, associated with ocular form of diabetes mellitus, hemophtalm, thrombosis and it’s complications, age-related maculodystrophy and other eye diseases. In our laser operating room which is equipped with the modern argon and niadim-YAG lasers from leading world manufacturers, we perform full range of laser operations for glaucoma, secondary cataracts, diabetic retinopathy, various retinal dystrophies, including myopic dystrophy in the case of age-related maculodystrophy, diabetic and post-thrombotic macular edema, central serous chorioretinopathy. The new technique of selective laser trabeculoplasty (SLT) allows to compensate open angle glaucoma in 1 - 2 procedures. We remove cataracts by the method of microincision cataract surgery (MICS) with ultrasound phacoemulsification and implantation of the best available foldable intraocular lenses (IOLs) such as Aspheric, Ultima (UK), Rayner Superflex (UK) Aspheric Foldable Bioline Yellow (Germany), Aspheric AcrySof IQ Natural, Alcon (USA), Aqua Free (UK), multifocal toric IOL AcrySof IQ, ReStor Alcon(USA),multifocal AT LISA, Carl Zeiss,(Germany), multifocal M-Flex Rayner (UK), multifocal AcrySof IQ ReStor Alcon (USA). To correct high degree myopia (shortsightedness) we are using eye surgery method of implantation of phakic intraocular lens (PIOL) - so called “glasses inside eyeball” or by the method of exchange of the natural lens for IOL of less optical power. By the method of exchange of the natural lens for IOL of higher optical power we successfully treat hyperopia (far-sightedness) of high degree and get 100% visual acuity without correction. To treat abnormalities of refraction of small or moderate degree we also using eye operation - LASIK (Laser - Assisted in Situ Keratomileusis) by an excimer laser of the last generation “Allegretto Wave”(Germany). We offer up-to-date method of cornea treatment – CROSS - LINKING too! Corneal collagen cross-linking with riboflavin, also known as CXL, CCR, CCL and KXL is successfully using for treatment of keratokonus and primary and post-operative endothelial epithelial dystrophy (EED) of the cornea. Glaucoma could be treated by full range of eye operations such as non penetrating deep sclerectomy, deep sclerectomy with allodrainage and others. Vitreoretinal pathology (retinal detachment, hemophtalm etc.) is treated by vitrectomy surgery with full necessary set of surgical manipulations (endolasercoagulation, separation of commissure of the vitreous body, blocking of retinal breaks, introduction of perfluorocarbon, silicon etc.) Often vitrectomy is combined with simultaneous phacoemulsification of cataract and IOL implantation. Our clinic has achieved a significant progress in surgical treatment of exudative form of age-related macular degeneration, accompanied by the growth of newly formed choroidal vessels that lead to the appearance of exudates, relapse hemorrhage, fibrosis, and eventually, to the blindness. Optical coherence tomography (OCT) in combination with fluorescent angiography (FAG) allows to determine the presence of choroidal neovascular membrane (CNV) and to localize it, detachments of pigment epithelium of the retina, the phenomenon of fibrosis and to eliminate these disorders by surgery. New special surgical microscope with additional equipment produced by "DORC" company (Germany) allows surgeons to remove vitreous body and to perform complex manipulations near the retina to remove membranes and fibrosis with endolasercoagulation of vessels. Pediatric Department works at our clinic very successfully. We provide conservative and surgical treatment of children from 0 to 18 years old suffering from such diseases as: congenital and acquired myopia (short- sightedness); progressing myopia; hyperopia (far-sightedness); spasm of accommodation; astigmatism; amblyopia; cataract; glaucoma; different kinds of strabismus, pathology of the optic nerve and the retina. 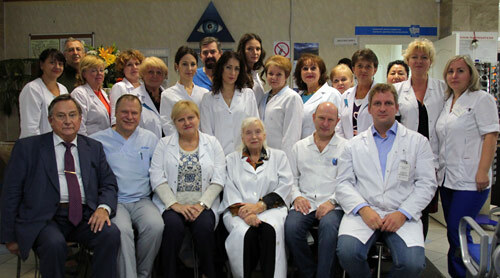 Ophthalmologic clinic «ОkoMed» - is a friendly and very responsible ophthalmology! We also have a very rich experience of curing foreign patients from all over the world and we are always ready to provide them with any possible support to visit our eye clinic for consultations, diagnostic and treatment, if indicated. Many of our doctors are English speaking; some of them even speak Arabic. We always consider medical reports sent by patients to get a “second opinion” or to have indirect consultation very attentively and replying as soon as possible. Please use this opportunity to get a professional opinion of your particular case. Our clinic is a team of professionals who love their job and sincerely wishing to solve effectively eye problems of each patient from diagnostic to treatment of the most serious eye disorders. Even in the most severe cases, the specialists of our ophthalmologic clinic will help you. «OkoMed» is a team of leading specialists in the treatment of eye diseases, disciples and colleagues of famous academician Svyatoslav Fyodorov, united by the idea of «Beautiful eyes for everyone!». Experienced surgeons, skilled doctors, using modern methods of diagnostics, treatment and the best worldwide available medical equipment produced in Germany, Japan, the United States and others, are able to deal with any eye disease of adults or children. Ophthalmologic clinic (eye clinic) «ОkoMed»: we will help You to save vision!